Not long ago, Pam Burrus and a few girlfriends were new moms walking while pushing their baby strollers to get back into shape after having children. Their walks eventually turned into jogs. 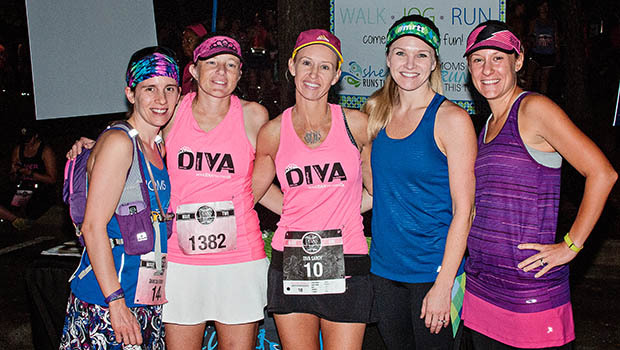 When those jogs led the four women to finish their first 5K together, Burrus knew it was the start of something special. "That's when I realized it needed to be a club—it needed to be something bigger than just us," recalls Burrus, 34. In March 2011, Burrus launched Moms Run This Town, an all-women's running club that began with a small group of mothers in a suburb outside Atlanta, Georgia. Thanks to social media and word of mouth, the club—which is free to join—has grown to 700 chapters nationwide and has some 20,000 members. To make sure all women and girls feel included, the club is also known as She Runs This Town, a name Burrus added last year. "When I came up with Moms Run This Town, I really had any town, any woman in mind," Burrus says. The popularity of Burrus' running club comes at a time when women's participation in running events is exploding. In 2014, 10.7 million road race finishers were women, making up 57 percent of all finishers, according to Running USA. By comparison, 1.2 million race finishers in 1990 were women, and men represented 75 percent of all finishers that year. As female participation soars, so does the need for running groups where women—especially beginners—feel welcomed and comfortable. Burrus remembers ditching a run with a local club years ago when she saw the crowd. "When I saw this group of older men, my first thought was, 'They are competitive, they are faster than me, and they won't understand me as a new runner,'" she recalls. Kelly Bither, running coach and the founder of the Runner Chick Training Club in the Portland, Oregon area, says it's common for women to feel intimidated to run with men at first. "A lot of women are self-conscious about the way they look," she says. "They feel like they have weight to lose. It's not as intimidating to run with a group if you feel like they are your peers." Bither, 50, started running in her late 30s and formed the Runner Chick club in 2011. Tapping into her coaching expertise, the club offers structured training programs designed for women preparing for their first 5K, 10K or half marathon. Bither says coaching women helps to motivate her own running. "It has kept me running," she says. "My best friends are from my running group. There are so many friends I wouldn't have if I wasn't doing this." Theresa Juva-Brown is a New York City-based journalist and former Gannett reporter who has covered a variety of topics, including breaking news, transportation and health. Theresa ran cross-country and track competitively for The University at Albany and has a master's degree in journalism from Syracuse University. She contributes to ACTIVE.com, Competitor Running, and Runner's World/Zelle. Follow her on Twitter at @TJuva.